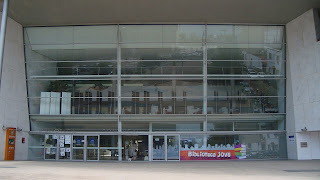 The first time I stumbled upon the library (06 along the Ruta Roberto Bolaño) it was closed. 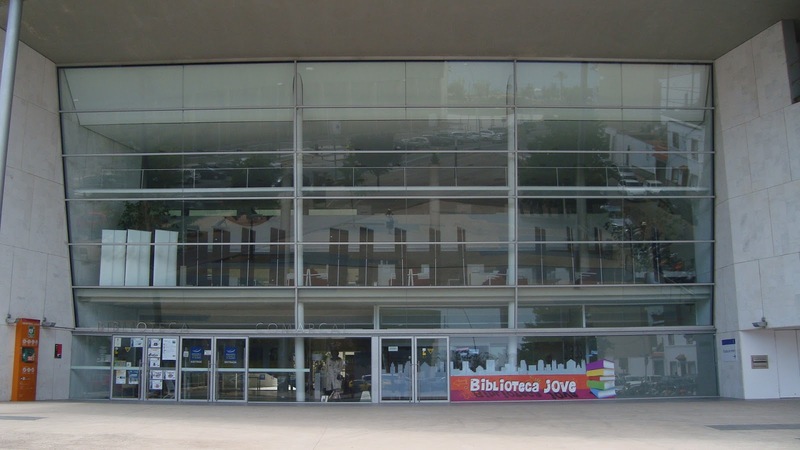 Through the window I saw an Agatha Christie book display––a coat rack disguised as a detective (trench coat, fedora, old-timey camera) topped by her books in Catalan translations. I returned a few days later, and the librarian, a man about my age who spoke little English, kindly escorted me to the Roberto Bolaño Lounge. He told me Bolaño’s children had helped dedicate it before leaving me alone to contemplate. In truth, the room appeared ready for meetings, not lounging. I recall a conference table and seating in rows. A big screen took up most of one wall. Near the door, there was a small collection of Bolaño’s work displayed on a spinning rack. For a few moments, I sat on a folding chair near the entrance. Here the room’s emptiness was most acute, and I waited, I suppose, for something to happen. In all my minutes there, nothing unusual occurred. I returned to the desk where the kindly librarian once again sat. Still seeking connection, some sentimental exchange, a reason to have travelled 6,000 miles to be among streets Bolaño once walked and sit in the cafes and bars of his own life, I purchased a canvas bag with the building’s name in blue paint across its surface and Catalan words that were outside my comprehension. The librarian seemed suddenly to take note that while he was a man at work, I was a woman on a journey. He told me he’d never read Bolaño, but understood many foreigners were quite taken with him. Shortly after arriving in town but before picking up the pamphlet––Ruta Roberto Bolaño––from the Blanes tourist office, I sat on a bench eating ice-cream near the entrance to a United Colors of Benetton store. It was from here I first spied the black and red plaque that would become so familiar over the next several days. At this site, the sign said in Catalan, before repeating itself in Spanish and English, was once a stationary store that pleased the author. Under the number 15 was something like an engraving of Bolaño’s face imprinted in the center of a red disc. The face seemed softer and more kindly than other images I’d seen of him. 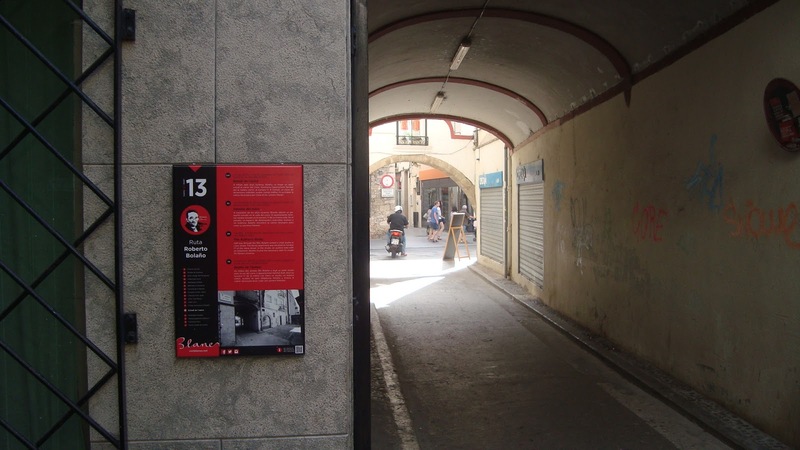 At that moment, I finally understood that in Blanes there was a walking tour devoted to the author. I came here only because I knew Bolaño had lived and also died in Blanes. I loved his work, and choosing this town as a destination gave shape to my travels. Earlier, I had gone to Portugal to stay with family friends. Blanes, in part, was a way to round out my journey––the kind of travelling I’d often fantasized about doing but hadn’t because fantasies, by definition, aren’t real. 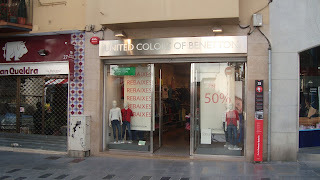 Now I knew, where once there was a stationary store now there was a Benetton’s, and the stationary store had pleased Bolaño. It thrilled me to suddenly realize I would be guided all over town in just such a way. Whereas earlier my arrival had made me feel aimless and alone, now I would know what I was seeing. Like the librarian, the man who sold the ice cream welcomed me. For the most part, Blanes’ streets were empty in the late afternoon, and he––perhaps surprised to see me out and about at a time where every local person was at home with family––asked me where I was from and why I was here. I said I had come because of Bolaño. He said he hadn’t known the man nor read his work. But his mother had taken care of the author’s children. A very nice family, according to the man who sold me the ice cream. Days later, while photographing the entrance to a writing studio Bolaño had once rented (13 along the Ruta) the ice cream man rode by on a scooter and waved. In this photo, you see him getting ready to turn right just under the arch. There goes the man whose mother once took care of Bolaño’s children.